The Uninterruptible Chemical Supply (UCS) system is a flow and level transmitter with advanced monitoring capabilities designed for use primarily with pulsating or intermittently operating chemical metering pumps. The UCS system can provide extremely accurate flow rates even in applications where pumps only operate with a very short pulse (i.e. few hundred milliseconds) and may only have one of these single short pulses in a 90 second period. The UCS utilizes mass measurements on the suction side of the pump with a very sensitive repeatable pressure sensor and a large orifice/high flow, non-restrictive valve (not a positive displacement meter like gear/spur or similar PD meters) and therefore can operate accurately without any influence from changing viscosities. It also has 1000:1 turndown within a single configuration but can have unlimited configurations to make it suitable for almost any flow rate or chemical compatibility. 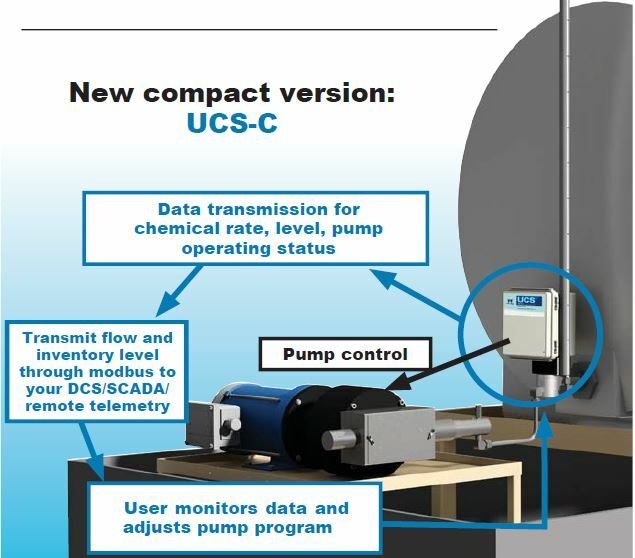 The compact version of the UCS system, UCS-C, does not require any calibration or configuration (other than entering the chemical density which can be done in the factory during testing prior to shipping to eliminate the need for any configuration in the field). Just install the UCS-C on the outlet of the tote, connect the outlet port to your pump inlet, power up with 12-24VDC and you are up and running with accurate flow and tank level readings. Additionally, you can choose to control your pump based on a flow set point or a PPM set point from another process variable. The set point and proportional control can be set up either in your own control system (DCS, SCADA, PLC, etc.) or in the UCS locally where the pump and tank are located, or a combination of the two. This means that operators don’t have to deal with different types/brands of flow and level meters depending on the different chemicals and ranges of flow rates in use around the facility. UCS systems can be provided from a stand-alone compact UCS-C ready to tie into a tote up to fully integrated UCS systems for new or existing pump packages meeting new construction specifications. The technology is protected under U.S.A. patent No. 7,263,448 and Canadian patent No. 2,501,530. The UCS can eliminate the need for someone to have to perform manual drawdowns and then manually adjust pump rates to meet required flow rates. This can save a lot of operator time and trips to the plant or field to check on pump performance or having to endlessly adjust flow rates. The UCS is performing this drawdown on a regular basis automatically. 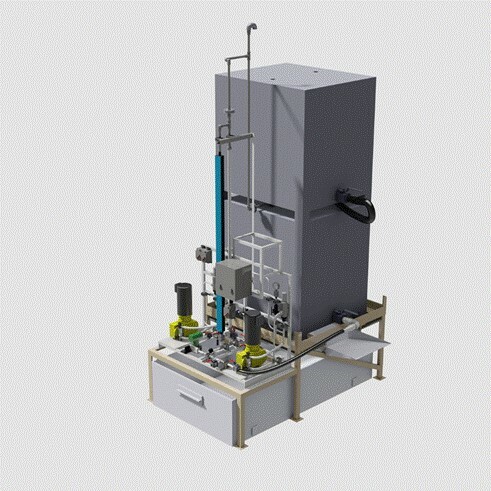 The controller sends a signal to open the chemical supply valve allowing the column to fill. The valve closes when the column is full (after a pre-set fill time). The pump draws chemical from this column. When the column reaches a pre-determined “fill” level, the valve opens to refill the column. The pump continues to operate normally while the column is being filled. This cycle continuously repeats. The change in fluid level in the column over time is monitored by a very sensitive pressure sensor, along with filtering algorithms, to be able to output a very accurate and stable flow rate that is responsive enough to enable closed loop control to a set point (Flow rate or PPM). It has been found that most sites are overfeeding chemical to ensure they don’t compromise the process by running short on chemical. 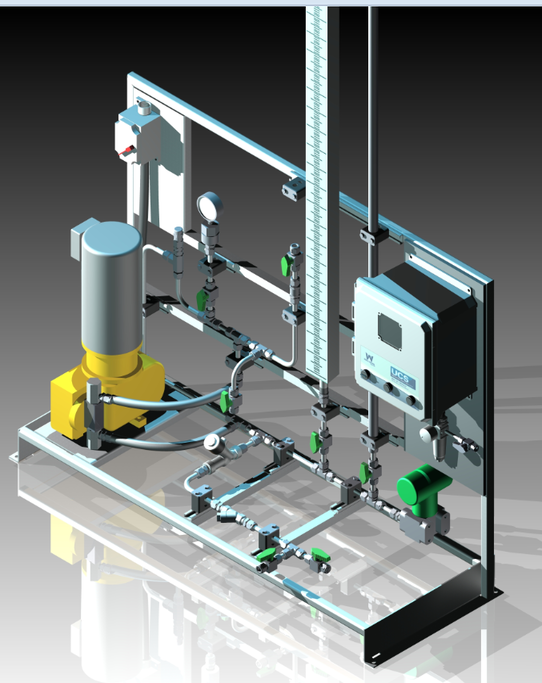 By operating the chemical injection pumps to a set point based on a process variable (i.e. process/product flow) typically 10 to 20% (or more) saving on chemical can be achieved in addition to the time that can be saved by not having to regularly monitor and adjust pumps. The UCS system also acts as a level transmitter for your chemical supply tank. The UCS outputs the tank level after the column has been refilled, and has hydrostatically equalized with the supply tank. This can mean quicker response for chemical inventory management. Early detection and indication of potential pump issues. Erratic or dropping flow rates can signal the need to inspect the pump before it completely fails. This can mean planned maintenance rather than emergency pump repairs which run up costs and cause potential plant upsets. Reduced risk of damage occurring to the pump from running dry since there is no need to manually operate any chemical supply valves. 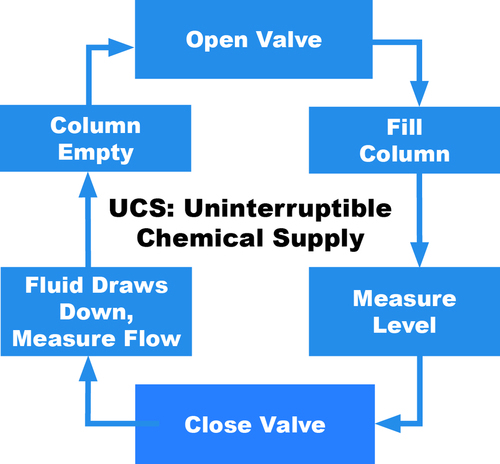 UCS-C is engineered with an integrated valve designed specifically for this type of service. Unlike most off the shelf valves that are not suitable for a very large variety of chemicals (especially high viscosity), high cycling, low pressure but large unrestricted flow and available in a compact, economical configuration suitable for low power (solar), hazardous area locations. The valve has been designed and tested for millions of operation cycles and is hermetically sealed. There are no shaft seals to leak or wear out! UCS can be integrated into new or existing pump packages utilizing client approved manufacturer components. The UCS Technology has been adopted by over half of the Alberta oil sand operators for control of critical applications. 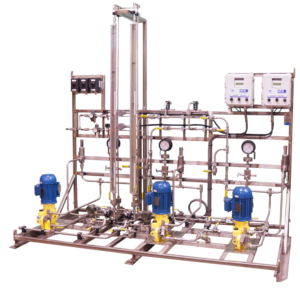 The options for customization can include larger valves for higher flow applications, specialty materials to meet any chemical compatibility, a variety of area electrical certifications (hazardous Div/Zone 1 or Div/Zone2 and general), and special client and site specifications. Each system is engineered, fabricated and tested completely in-house by our multi-disciplined team of engineers and technicians. Hard-wired or wireless systems provide real-time communication with the control room or PLC/DCS or SCADA, delivering instantaneous responses to process changes and ensuring accurate chemical feed to a set point. This means more optimized operations, reduced downtime and a smaller carbon footprint. It also minimizes operator time requirements. Tank-level monitoring provides redundant confirmation of proper injection rates and helps to maintain adequate inventory. Q: Can I not just use a pressure sensor to monitor my tank level and achieve the same results as a UCS system? A: Utilizing a pressure sensor without an automated valve and column can provide a delayed flow rate (hours or days response time depending on tank size and volume being pumped) compared to a much quicker response time of seconds when using the UCS system. Monitoring only tank level using a pressure sensor may be suitable for non-critical applications that may not require quick notification that a pump isn’t performing properly or for inexpensive chemicals or non-critical process that does not require precise dosing or dosing to a set target rate. Q: Will UCS work with any type of pump? Q: Can the UCS control any type of pump? A: Yes. We can provide variable speed for AC, DC motors as well as on/off control for a variety of different pump types (solenoid metering, hydraulic metering, air or electric piston, AODD etc.). UCS can also replace an “old school” timer system with set point control. This eliminates a lot of guess work and timer configuration. Just enter a flow-rate or PPM set point (if controlling based on an external process variable) and walk away. UCS can quickly and accurately measure flow rates of any type of intermittently operating pump (even solenoid or other types of pumps that pulse or operate for very short durations only once each 90 seconds). Q: Can I use UCS for any chemical application? A: Yes, we can likely find a material that will be suitable for your chemical and we can size the components to work with your application, no matter what the flow rate/range is. Q: Where are the UCS systems manufactured? A: We engineer and manufacture our UCS systems in-house at our Edmonton, Alberta facility. This allows us to custom configure each system for most any application and deliver very quickly. We also offer phone and field technical support and maintenance services.